Hi, Elizabeth here. The past few weeks have been busier than usual. That means I’ve let writing out my typical weekly plan for meals slip, even though I know having a plan makes me feel less overwhelmed! It’s during these times that I rely on my Go To Meals. Life can get so hectic. I like to keep a supply of items we can use to get dinner on the table when I haven’t had a chance to get to the store, or for those nights when there’s only 30 minutes to get dinner on the table. You know those nights! You had to be at work late and everyone else in the house has some sort of lesson or practice they have to get to soon. 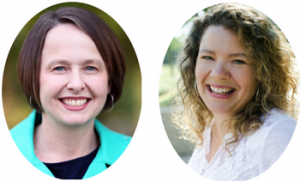 Anna and I both find ourselves reminding our clients that meals don’t have to be involved or perfect to be nourishing. So often, we find people feel they have to cook something involved for it to “count” or for a meal to be “real”. Who has time to pull up a recipe and cook an involved meal every night? 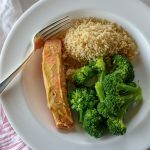 One of my family’s favorite meals is mustard salmon with broccoli and couscous. That’s a good thing, because it’s been one of my Go To Meals for a looooong time! I buy frozen salmon. Where do I buy it? Whole Foods usually. It takes about 15 minutes to thaw under cold running water. 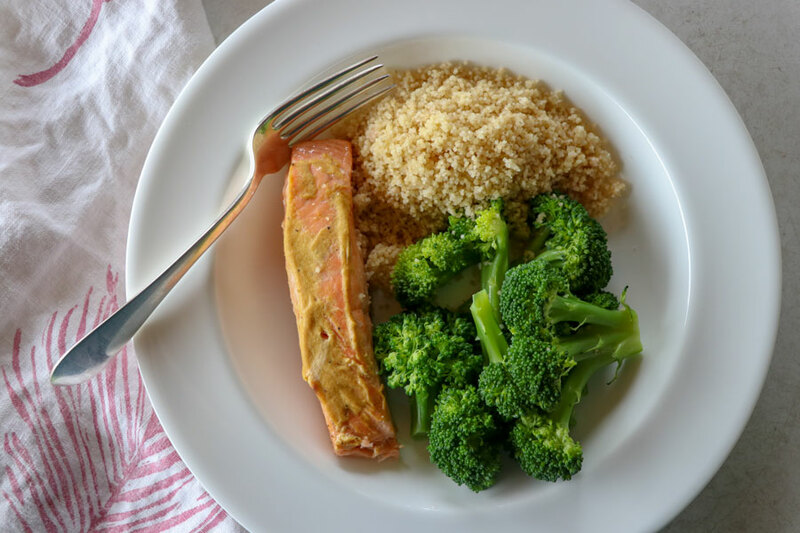 While the salmon is thawing and the oven is preheating to 425 F, you can cut the broccoli, boil water for it and gather together the ingredients for the couscous. Fill a medium pot with water and add 1 teaspoon of salt. 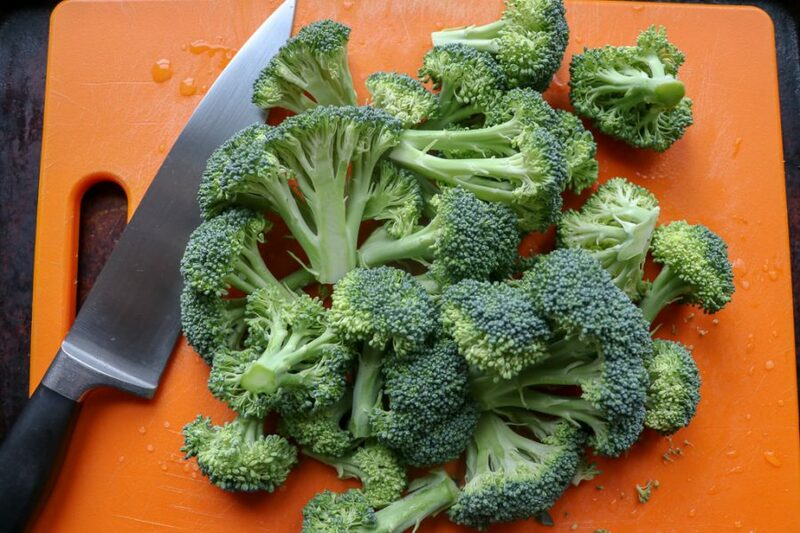 Bring the water to boil for the broccoli. 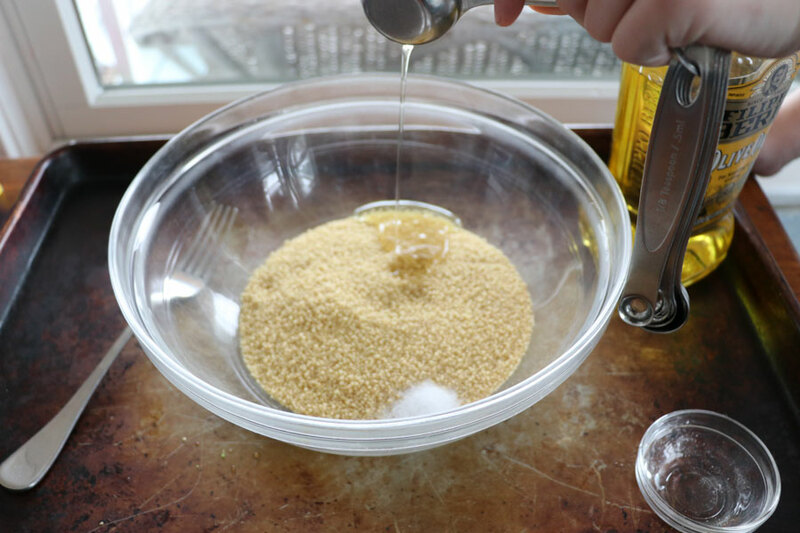 Measure 1 cup dry couscous into a heat proof bowl. Add 1 tsp. salt and 1 Tbs. of olive oil. Stir with a fork. Then add 1 cup of just boiled water and stir with a fork again. Cover the bowl and set a timer for 5 minutes. Salt and pepper each piece of salmon. Brush 1-2 teaspoons of Dijon mustard on each piece of fish. If you are worried about it being too mustardy, start with 1 teaspoon per fillet. We love mustard in our family, so I always use at least 2 teaspoons. 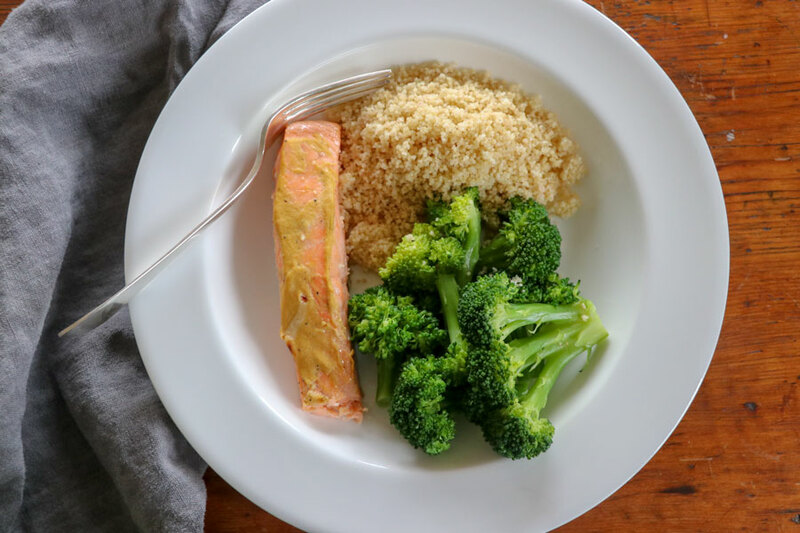 A few minutes into cooking the salmon, place the broccoli into the boiling, salted water. Don’t forget to put a lid on the pan, or your whole house will smell like wet broccoli! Now drain your veggies and toss with a teaspoon of olive oil or butter and season with a little salt and pepper. If there is skin on the salmon, just lift the fillet off the skin using a metal spatula. 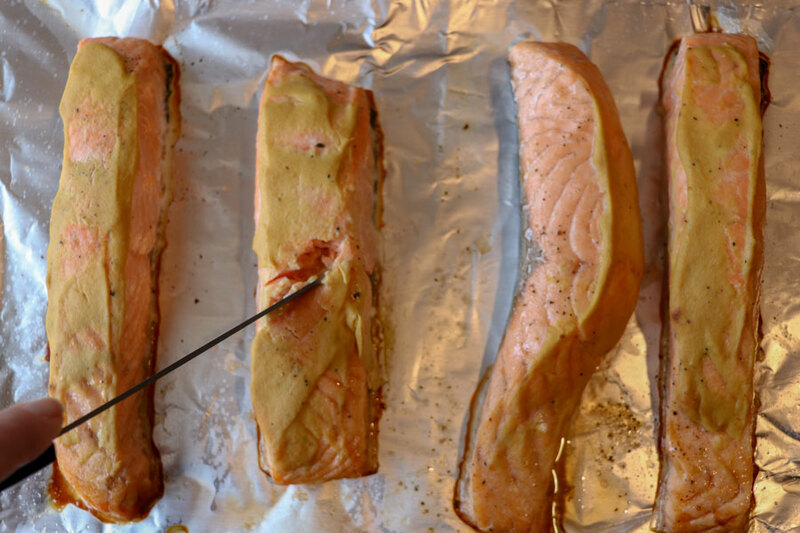 I purposely don’t put any oil on the foil under the salmon so the skin will stick to the foil. Once you lift the salmon off the skin, just remove the foil from the pan and throw it away. This makes for EASY clean up! Dinner is served! What do you make when you have only 30 minutes to get dinner together? Let me know if you make this quick and easy meal! I’d love to hear from you! 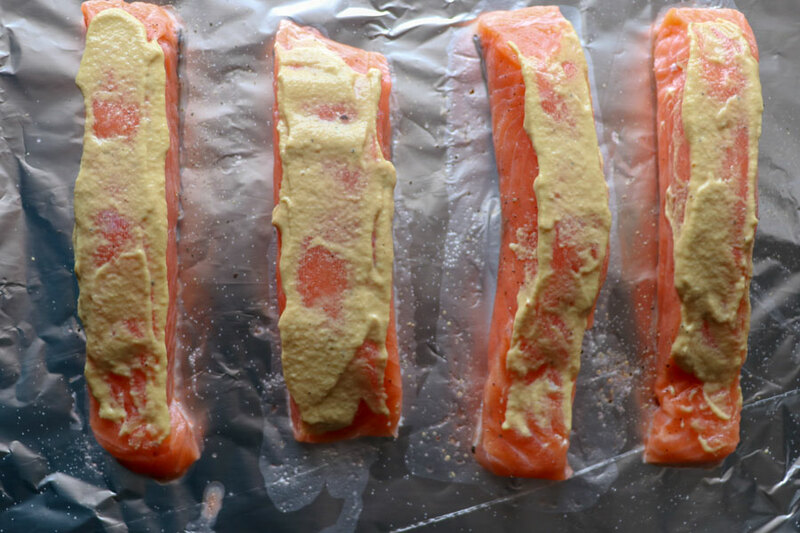 Salmon fillets brushed with Dijon mustard. Preheat your oven to 425 F. Place 4 frozen salmon filets still in their plastic wrap in a large bowl under cold running water. 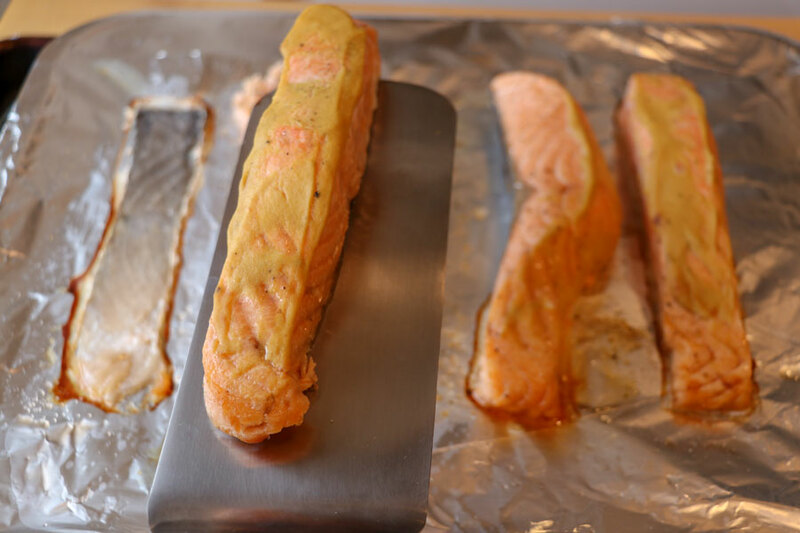 Cover a half sheet pan or broiler pan with aluminum foil and place the salmon fillets on the foil. You don’t need to oil the foil because you want the skin to stick for easy clean up. If you like to eat the skin, then oil the foil. Sprinkle each piece of salmon with salt and pepper. Place the pan on the middle rack of your oven. Cook the salmon for 10-15 minutes. Check for doneness after 10 minutes by inserting a knife into the center of the salmon and if it separates easily and is opaque, it’s done. Alternately, you can insert an instant read thermometer and cook the salmon to 145 F.
Using a metal spatula, lift the salmon off the skin. 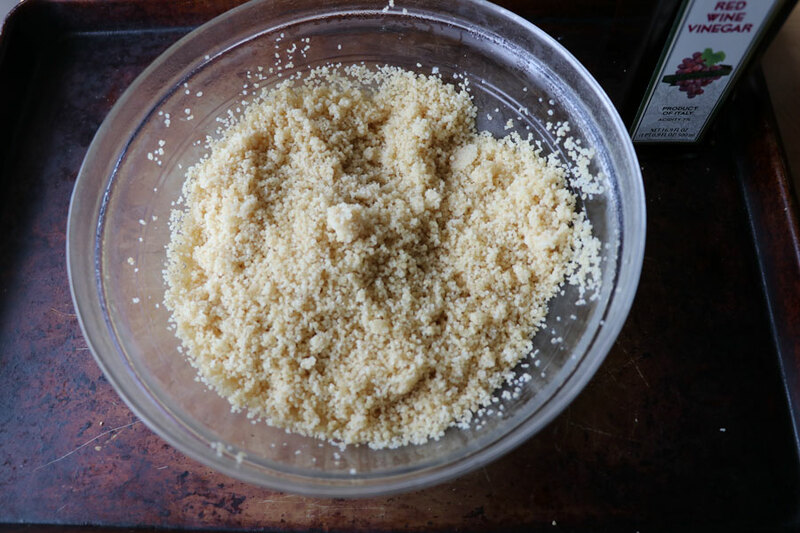 Place 1 cup dry couscous in a heat proof bowl. Using a fork, stir in the salt and olive oil. 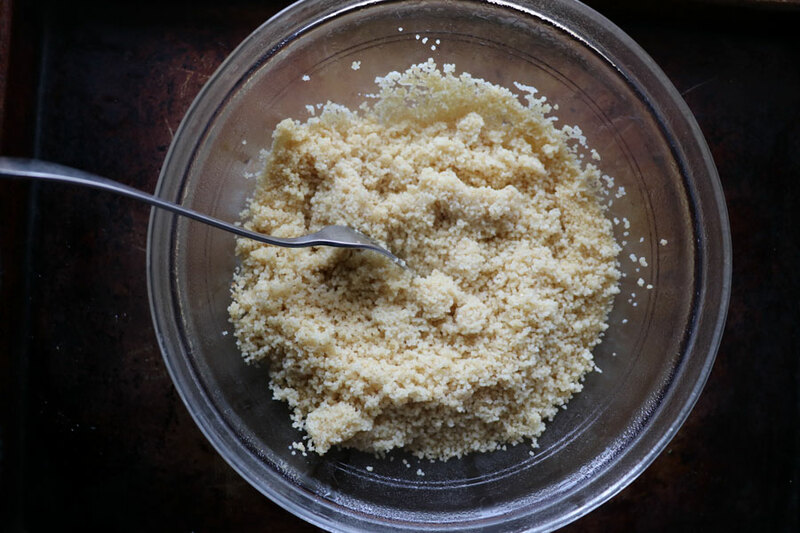 Pour the boiled water over the couscous and stir with a fork. Cover the bowl with a lid. After 5 minutes, lift the lid and stir the couscous with a fork. Don’t worry if you forget this step. The couscous will be fine. 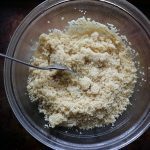 After 10 minutes, remove the lid, stir the couscous with the fork again. Cover the bowl with a paper towel or plastic wrap and place it in the microwave. Heat for 30 seconds-1 minute depending on your microwave. Remove paper towel or plastic wrap, add the vinegar and stir with that fork one last time. I picked up this recipe from Elizabeth many years ago. It has become one of my go to recipes as well! Delicious and simple. Both of my kids request salmon prepared this way. I will try to your cous cous method next time. Love the prep/ cook time breakdown on this meal.